Are you into hiking, hunting, or survival? Is Outdoor your middle name? Then you need a knife you can count on. Most store-bought knives are either frail and inexpensive or cost quite a lot. And even those ones aren’t that reliable, particularly if you have different activities in mind for your knife. If you feel we’ve hit a sore spot, it’s time you learn how to make a knife of your own. We’re not just promising durability, entertainment and a lower budget here. Some of the steps require painstaking work, and for others, you might even choose to outsource your work. But it’s well worth it, since you’ll end up with a reliable tool, and the money will be well spent even if the overall budget isn’t much smaller than that for a store-bought knife. 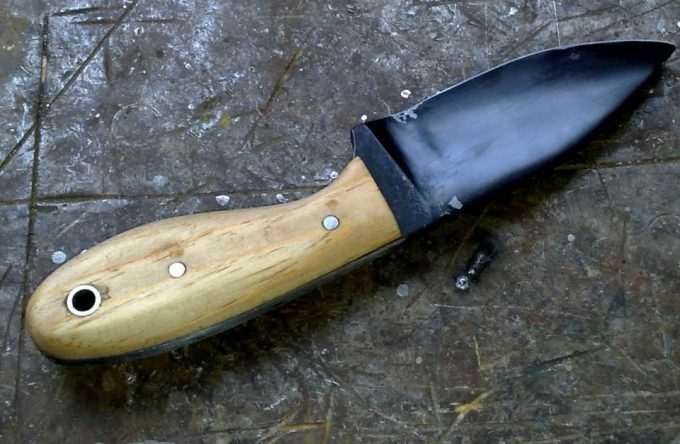 So in this article, we’ll give you all the necessary info and steps on crafting a knife. We’ve settled on a more basic model, but you can easily change some of the materials and design we used here to make different knives. Who knows, you might even fall in love with knife making as a side perk. Getting a good sketch of your knife is essential, particularly since the actual crafting takes so long. So it’s well worth it to invest a bit of time to make the right plan to follow or otherwise you can end up wasting precious time. And if there’s something you feel it’s not working, you can always alter the sketch instead of real-time improvisations on the knife. Ease of making. It’s best to start with a more basic model, like a hunting knife. However, if you’re already a DIY wizard, you can choose to make a more elaborate model. Design a model that suits your intended purpose, considering there are significant differences between cooking, hunting or brush-cutting knives. Once you’ve decided these basics, there’s the issue of how you’re going to attach the handle and the blade. The handle and the tang have the same profile, and there are also slabs on each side that you can attach using screws, bolts or epoxy. A knife with a full tang is really sturdy, so we’ll be making this sort of model. This doesn’t extend for the entire grip portion, but it has the advantage of weighing less. You can always choose this option since it extends more, and it connects with the handle using a rivet. So this is sturdy enough, though it weighs less so it’s a really versatile model. Now that all that is taken care of, you’re ready to draw the knife you want on paper, keeping the scale. Then, you can cut the sketch and trace it on the steel if you’re sure you won’t be making any changes. Let’s start with the list first, then we’ll discuss some of the things you’ll need below. The first question you should ask yourself is: what steel should you choose for making the knife blade? We’ve chosen carbon steel 01, but there are other options too. Carbon 01: with less than 13% chromium content, this material doesn’t offer a good protection against rust by itself, so you’ll have to use multiple layers of coating. But we like it the most for hunting and for building standard knife models because it’s incredibly tough. Stainless: with its more than 13% chromium content, this is an awesome material for increased resistance to water and corrosion. This is amazing for humid conditions, especially when you’re out hiking, or for fishing. D2: If you’re looking for a mix between these two, D2 is your go-to solution, offering good water resistance, as well as solid performance under increased pressure. If you’re going with our carbon 01 choice, you should also make sure you get it annealed. This is a property of the carbon atoms which shows you they form molecules that allow you to shape and work with the steel in DIY projects. You can get annealed carbon 01 steel from various websites, including places especially intended for DIY fans and people who are passionate about making knives. Durable and comfortable in terms of grip, you can easily customize it to your liking. Since wood is a porous material, though, itmight not be great for humid conditions. This is an affordable material, it’s really traditional and easy to customize. However, it’s easy to crack and brittle, and the grip isn’t top notch either. Stainless steel. This is great for rust resistance, but it can be slippery when wet. This is a sturdy, yet light material, though it’s slippery too as well as easy to scratch. Carbon fiber. Looks like a million bucks, it’s really strong and light, but it’s likewise very expensive. Great in terms of resistance and low weight, but not so great in terms of your budget. It can also feel a bit brittle. We’ve chosen a dark wood for the handle, though, which isn’t as porous as soft wood, so you can use it in humid weather too. And we’ll also apply some wood sealant on it, so this coating will add more water protection. To complete this step, you’ll need to get your sketch. Steady your hands, though, and begin with profiling the blade. Place the sketch on the steel and draw around it using either a permanent pen or a sharp tool. Get your hacksaw and cut the outline, leaving about 0.1 inches around it. Grab your file and smooth out the profile. Now it’s time for the bevel, so draw the edge of the blade on the steel. Secure the blade on your table. Get your file to grind the edge, keeping a constant acute angle with the steel. When you approach the line drawn at step 4, don’t go past it if you don’t want a dipped knife. Repeat 5-7 on the other side, but be prepared for 2-3 hours’ worth of work for each side. After this is done, you’ll start drilling the blade, so make 2 fixing points for the bolsters with a 4 mm size, which is equal to the brass bar size. You can position them anywhere you want to, but we prefer them to be near the center of the bolster, at equal distances from its sides. Continue with making another 2 fixing points for the handle scales, with a 3.5 mm size, but drill them before you heat-treat the blade. We also prefer to position these near the center of the handle, at equal distances from its sides – it looks classier. Now prepare for another few hours’ worth of work to finish the blade with sandpaper. You should start with a rougher, coarser sandpaper to get rid of more prominent notches, then move on to a finer sandpaper until there aren’t any more grooves. The smaller the grooves, the smaller the sandpaper you should use, until the blade is completely smooth. You should smooth out the entire blade, even the part where it’s covered by the handle to make sure it’s a good fit. Besides, it’s worthwhile taking your time so you won’t miss any part of the blade that isn’t actually covered by the handle. You can now proceed to heat treating the blade, which is pretty complicated so you’ll need to muster all your dexterity. It’s better to continue with this step on a new day. If you’re back here, you should heat the steel in order to demagnetize it. After that’s done, you should dip it in oil to make it harder. Remember not to drop it now, seeing as it’s very fragile at this point and it can break into a million pieces. Carefully take the blade out of the oil and temper it by heating it at a temperature between 350 and 450ᵒ F, depending on how hard you want it to be. The higher the temperature, the softer the blade will be, but keep it for about an hour in the oven. * If you want to skip this step, you can always send your knife to be professionally tempered. But if you want to do it at home, you might want something better than a simple oven, like an oxy-acetylene torch or a forge. Now it’s time for the second finish, which means getting rid of the black color given by the oil residue after you’ve tempered it. You should also start with a coarse sandpaper, then continue with increasingly finer sandpapers to reach about 1200 grit, which will make your blade look smooth and very professional. For a silky touch, you have the option of applying some car body rubbing on a piece of soft cloth and rub the blade with it. Be sure to read the instructions, though, different brands require different things. Grab a piece of cardboard and fold it to improvise a sheath. It’s even better if you have your own sheath because that will keep the blade safe from possible abrasions when you attach it to the handle. Grab 2 pieces of brass that are equally thick. Put the blade over the brass and draw around it. Fix the brass pieces together. Use the file to smooth out the area around the blade, which is also called the Ricasso area. Make sure you mark each piece of brass, so you’ll know which one should be placed on the right side and which one on the left. Get a bolster and attach it to the handle. Grab the drill bit you used for the bolster holes and with it, drill through the holes. Now drill through the brass part. Repeat the drilling process on the other side. Get a few countersinks and attach them to the exterior part of the bolsters so the brass won’t expand when you peen it. Get the 4 mm brass bar and cut a couple of pieces from it, making sure you get about 0.1 inches on both sides when you put the bar on the blade and bolsters. Place epoxy on the part of the blade where the bolsters will be, but not too much or it will overflow when the brass is tightened. Put the bolsters on the blade, and push the bar through them with a hammer. Now place the blade on an anvil or another sort of metal surface. Grab your peening hammer and unleash your strikes onto the metal pin, while you keep constantly turning the knife on both its sides so the brass bar gets a better grip on the bolster. Here comes another break – this one is 24 hours until the epoxy is cured completely. If you’re well rested, it’s time to start the sanding process so the brass bar can’t even be spotted. If at first, you don’t succeed, you can grab your file to make the brass flush or even sandpaper for a more ergonomic grip. We’re moving with rapid steps to the last tedious and long part of this knife’s construction. The handle is an extremely important part of the knife, so work carefully. Grab the handle slabs and put them on the blade, where they should finally be. This is when it really helps for the steel blade and the brass part to be entirely smoothed out. Get one slab and tighten it on the knife. Remember the drill bit you used for the drill hole in the Corby Rivet? Use it for drilling through that hole, through the handle and the wood, on both sides. With a narrow middle, the rivet needs larger drill bits for the top and bottom, so the wooden slabs look as a mini-shelf. Now you can screw the rivets and apply epoxy. Put the slabs in their designed places and clamp the rivets. If some of the glue starts getting out because of the compression applied, wipe it off with a moist cloth and don’t over-tighten the rivets. Here comes a hard step: get another full 24 hours break. Start the shaping process by using a wood saw to get rid of the extra wood. Grab a file and start shaping the handle to its desired form, but have a rasp nearby too, especially for the brass rivets. When you get to the same thickness of the steel handle and brass bolster, it’s time to get the coarse sandpaper out for a smooth transition. Constantly decrease the degree of coarseness of your sandpaper, until you’re using a very smooth one to finish the handle. Get a soft, clean cloth and put some wood sealant on it, rubbing it slowly on the handle to cover it completely. Let the sealant dry for 45 minutes to an hour. Get a piece of 1000 grit sandpaper and smooth it out. Repeat steps 13 – 15 three times through. Get some CCL finishing oil on your finger and start rubbing it into the wood, using clockwise movements, until it’s completely covered. Let the handle dry for half an hour, then clean it off with your finger. Rub the handle really fast with your palm for approximately 30 seconds, until it gets really warm so the oil can get in. Let it rest for another full 24 hours. Repeat steps 17 to 20 three more times. Now that all the knife parts are assembled, you can take care of the finishing touches, the most important of all being how sharp it is. Grab a sharpening stone and put it on the table, making sure the coarse side is facing up. Add some mineral oil on the coarse side. Scrape the stone, making shallow cutting movements, at a 20ᵒ Don’t press into the stone. Do this on both sides of the blade, constantly changing between them until you get a V-shape edge. Now turn the sharpening stone with its fine side upwards and put mineral oil on it. Do the same shallow movements and keep the 20ᵒ angle to make sure your blade is as sharp as possible. Repeat the same movements on kitchen steel to really add the cherry on the cake. Test how sharp your blade is by using the knife to cut through paper. If you can’t do it, the knife can still get sharper. We’ve taken you through all the necessary steps to craft your own knife, starting with the plan, the materials and putting all the pieces together. So now you can move on to different sort of knives, with various blades, handles and even add your own engravings to personalize the look of your knife. So at this point, you might ask yourself whether it’s really worth it to make a knife rather than buy one. You might feel discouraged by the required drawing skills necessary for sketching the knife profile, or by the long breaks in between some of the steps. And smoothing out the blade and the handle requires a lot of tedious, scrupulous work. But apart from the painstaking process, you get all the benefits of making your own knife. For instance, you can rely on its durability, and you can customize it however you want, for whatever purpose you want. You will also improve your DIY skills and develop new abilities, maybe even end up with a new hobby. That said, we’re curious to hear more from you. Why do you want to learn the ropes of making a knife? What will you use it for? Which step sounds the easiest? Which one is the hardest? Leave us a comment below, and come back when you’re knife is done too to tell us how it all went.